Join us for a presentation by nationally acclaimed National Geographic photographer Gabby Salazar. Ms. Salazar's presentation will take you through her journey as a photographer, venturing into unique lands such as Borneo. Her motivational talk is being presented for FREE here at the Savannas to help raise donations towards the furnishing of our brand new Education Center additions of a lecture hall and wet lab. 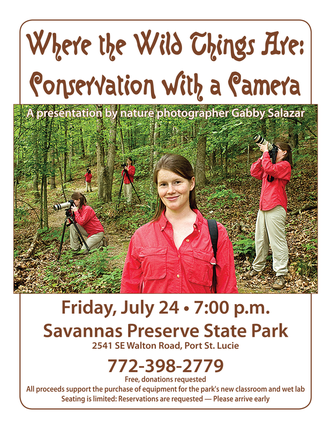 Jensen Beach, FL – The Friends of Savannas Preserve State Park invites the general public to join them for Where the Wild Things Are: Conservation with a Camera, a presentation by nature photographer Gabby Salazar on Friday, July 24th at 7:00p.m. Gabby Salazar is a young nature photographer from Greensboro, North Carolina. When Gabby was 11 years old, her father gave her a camera and she was hooked in just a few short minutes. Since that time, Miss Salazar has traveled throughout North America and to over fifteen countries to take outdoor photographs. In 2004, this amazing young woman was named BBC Young Wildlife Photographer of the Year and in 2002 she won the Nature's Best Photography Youth Category. In September of 2008, Miss Salazar was recognized by Glamour Magazine as one of the Top 10 College Women in the United States for her work with children, photography and the environment. Miss Salazar graduated from Brown University in 2009 with a degree in Science and Society. She hopes to pursue a career in conservation and natural history publishing. Miss Salazar is also committed to conservation and education. She has been working with Nature's Best Photography since 2006 to found Nature's Best Photography Students, a free, bi-monthly, online magazine by students for students. See www.NaturesBestStudents.com to view the magazine. Miss Salazar is currently the President of the North American Nature Photography Association (www.nanpa.org). She gives photography presentations as a young motivational speaker across the country. As a female nature photographer, she especially enjoys presenting to women's groups and girls schools. Miss Salazar's Conservation with a Camera presentation is free and open to the public, though donations are requested. All proceeds support the purchase of equipment for the park's new classroom and wet lab. Seating is limited, please arrive early. To learn more about Savannas Preserve State Park and all of Florida’s award-winning state parks, visit www.FloridaStateParks.org.